How VALUABLE were the ideas and concepts Joel presented? How EFFECTIVELY did Joel present the material? 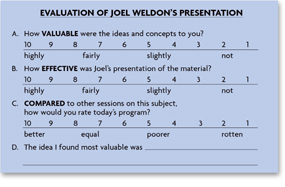 How did Joel's program COMPARE to every other program they have attended? How many speakers have you hired that actually put their fee on the line? Preparation is the key! Joel will spend over 50 hours preparing for your program to make sure the ideas are right on target, and your investment includes all the planning and preparation time. Your investment entitles your organization to a fifty percent discount on any of Joel's CDs for up to one year. © 2015-16 Joel H. Weldon & Associates, Inc.